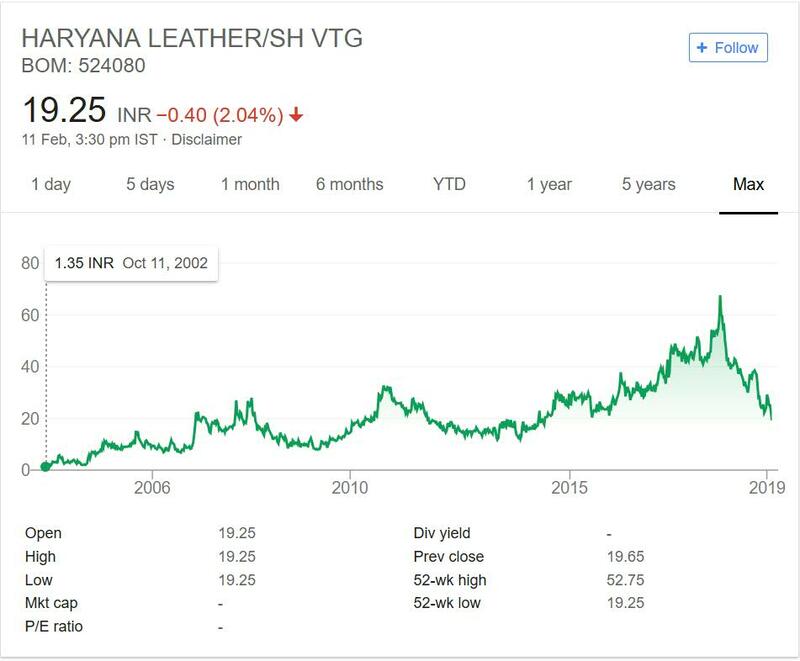 Haryana Leather Chemicals Ltd. is in portfolio of Subramanian P. He is one of the top investors in India. It is a Specialty Chemical Company. It is Haryana state government sponsored project. As per the Company website it a joint venture with ICAP-SIRA ITALY, having technical alliance with VISMON –SPAIN is an integrated research and manufacturing facility for chemicals for leather, textile, footwear and PVC processing. The manufacturing plant is situate in Jind Haryana. It has capacity of 6,000 MT of performance chemicals in diverse fields (those mentioned above). It has presence in 25 countries. The company exports products to its clients located in US, Europe and Middle East. The Company was trading at 1 INR in year 2002. At present it is trading at 19 INR level. So roughly it has given 19 times return in past 16 years. It is decent returns considering it is still very small company. Note the prices went past 60 during recent bull run. Investors have made money in it over the time. Over the years the prices never went crazy. The price movement was smooth with occasional more than normal increase and decrease in prices as per market sentiment. Personally I do not like crazy movements followed by steep decline in prices. Those are speculation based price movement not performance based price movement. Haryana Leather Chemicals operates in Specialty Chemicals segment. There are many companies listed in this segment. There are some foreign Multinational companies listed in this sector as well. Chemicals sector have performed well over the last few years. Some of them have turned Multi Baggers as well. Most of the Companies have become big and can be termed as Small Cap or Mid Cap. Haryana Leather Chemicals is still a small company. It has given good returns in past. The sector looks promising. I already have one Chemical Company in my portfolio so I will not track this Company. The reason is I do not want to increase exposure in the sector.In case you are interested then you can track the company by adding it to your stock watch list. That way you can keep close eye on the Company.